Belfast, ME – Land For Good trained real estate professionals on working with farms with commercial agricultural potential. Sharing their expertise, Jo Barrett, LFG’s Maine Field Agent, and Mike Ghia, LFG’s Vermont Field Agent, present at the Hutchinson Center. 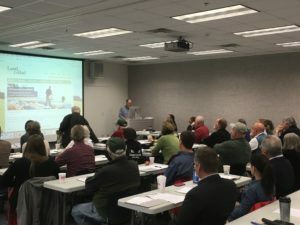 Land For Good’s expert field agents, who are also experienced farmers, presented a training course for real estate professionals in Belfast, ME this spring to advance the conditions under which many aspiring, beginning and established farmers seek land. 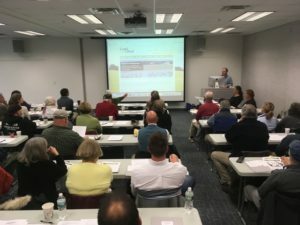 Working with Maine Farmland Trust and Maine Farms Realty, this training course, Tools and Resources for Working with Farms with Commercial Agricultural Potential, helps improve the ability of real estate professionals to connect with commercial farm buyers. Maine’s real estate professionals received tools and resources to best describe farm property to potential farm buyers, such as soils, field acreage, buildings and infrastructure, as well as water and forest resources; discovered legal and tax issues relevant to farm properties; explored conservation easements; and examined state and regional “land linking” programs such as Maine FarmLink and New England Farmland Finder. 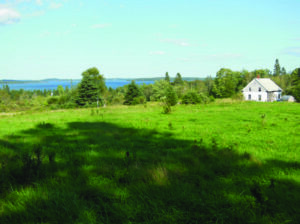 Maine’s real estate professionals are really eager to connect with commercial farm buyers. Agents find that many beginning and aspiring farmers turn first to MLS (multiple listing services) when embarking on a farm property search, and often end up with many unanswered questions. This training supports the conditions under which farmers seek land and the things that bring value to an existing farm. The program has been well received in Maine, New Hampshire, and Vermont by nearly 150 real estate professionals so far. They rated the course as Excellent with suggestions to offer this training to a greater real estate audience. LFG designed the original course with help from our friends at UVM Center for Sustainable Agriculture and Vermont Land Trust. This course was developed and delivered with support from The John Merck Fund and Cedar Tree Foundation. Sponsored by Farm Credit East.